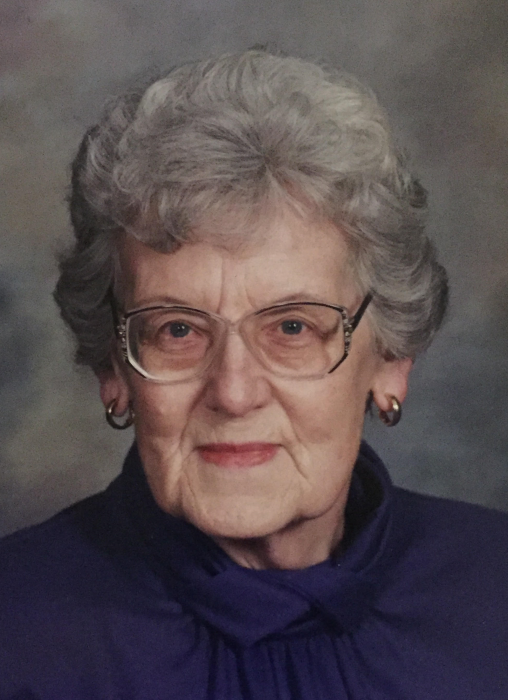 Luvilla Celia Hofschild, age 95 of Plymouth, WI, passed away peacefully on August 13th at Rocky Knoll Healthcare Center. She was born on June 25, 1923 in the town of Herman to the late Calvin S. Hanke and Cynthia (Kissinger) Hanke. She attended Plymouth District Grant School and Plymouth High School. Rev. Otto Saewert of Zoar Evangelical and Reformed Church in Plymouth, married Luvilla and Harold R. Hofschild on October 22, 1941. Harold and Luvilla farmed in the town of Plymouth until 1969. They then moved to a Plymouth subdivision. Harold preceded her in death in 1984. She was a member of the Salem United Church of Christ since 1946. Her “job” was taking care of her family. She loved helping raise her grandchildren and making family dinners, which included her famous German potato salad and sugar cookies. She volunteered at Rocky Knoll for a number of years. To make sure others heard God’s word, she would drive ladies to church each week. She also took the tape of the service to Rocky Knoll each week, so it could be played for the residents. Back in the day, Luvilla and Harold loved to spend time dancing. Luvilla always had music playing on her record player. Her favorites were Lawrence Welk, Glenn Miller and Harry James. She loved gardening as well. Luvilla is survived by two daughters and a son. Her oldest daughter, Judy Zeitler and the late Edgar Zeitler have two children, Trent and Julie. Judy resides in Shawano, WI. Trent (Jessica) Zeitler have one daughter, Zoë. Dennis (Riina) Hofschild is Luvilla’s middle child. They currently reside in Estonia. He has three children. Lani (David) Rooney is his oldest. His second child is Kelly (Fred) Jordan who have two children, Ty and Jada. His youngest is Kimberly (Eric) Cimuchowski. They have two children, Hannah and Joshua. Luvilla’s youngest is Lynn (Edward) York. They live in Plymouth, WI. They have three children as well. Tina (Tim) Krohne is the oldest. Crystal (Luis) Tillett is their middle child. Crystal and Luis have one daughter, Olivia. Ed York II is their youngest child. He has a fiancé, Jackie Stefanski. Luvilla is also survived by two sisters-in law, Inez Luna and Blanche Hofschild, as well as many cousins, nieces, nephews, and friends. Luvilla’s loved ones who preceded her in death were her husband, Harold, her sister Audrey Kalk, two brothers-in-law, Elton Kalk and Leland Hofschild, one son-in-law Edgar Zeitler and two daughters-in-law, Gaya Hofschild and Nita Hofschild. In lieu of flowers, a memorial fund has been established at Salem United Church of Christ, as well as the Rocky Knoll Healthcare Center Life Enrichment fund. Luvilla’s family would like to thank the staff of Rocky Knoll Healthcare Center for the wonderful care and friendship they gave to her. They also want to thank the staff of Compassus for the compassion given to them during this difficult time.